Nothing fancy here, just 3 little bowls…..first time trying the bowl turning thing….and got lots of help from fellow LJ’s….thanks folks. Nothing impressive, but lot’s of fun learning the process. I really should have started with some green wood, but instead these are really dry…..Redheart, Olivewood and Purpleheart. No soft wood here!! I have a new found respect for all the bowl turners out there….....there is a bunch to know! Nice start. Now you are headed in a new direction from all your cutting boards. There are so many things to do on a lathe. FYI the Purpleheart will gradually turn brown. The only way I know to slow that down is to seal it with varathane or salad bowl finish. If you are going to work with “wet” wood be sure to research how to dry it quickly in a microwave. There is lots of information on the internet about this. Thanks Les….good info. I’m familiar with the Purpleheart thing and it will be as nature intended it! Appreciate the tips! They look pretty fancy fro here!!! All that is needed to improve these…. I think you get the point!!! Knowing your ability with accurate & artistic glue-ups…. I’m eagerly awaiting a few segmented works of art!!! Hey Randy…..your sharpening jig started this whole thing….. It was, hey “I got a bowl gouge”.....I wonder what I can do with that?? Glad to help feed the new addiction!!! I need to get me some bowl blanks…. & see if I can come up with something half as good as yours. That is pretty impressive for you first go at bowl turning ,they turned out great . I am curious about the lathe you have and also the tools I may have to get a lathe to do some handles and such and it looks like a lot of fun . I have the basic 8 piece set of Benjamin’s Best tools from PSI, plus 3 homemade carbide tools using Easy Wood Tools inserts, plus a Sorby SpindleMaster…..oh, and a PSI chuck. 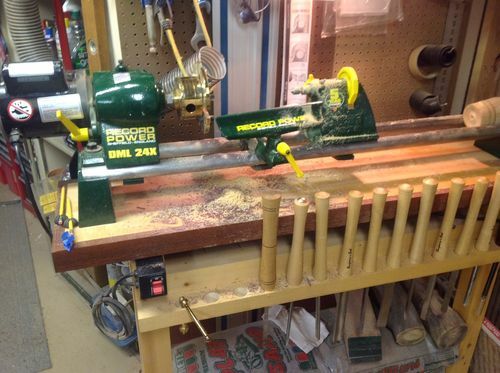 Actually, the lathe was the first LJ posted project…. Thanks Gary…...I thought I heard you might be turning some bowls?? You are off to a good start. Can’t wait to see you turn one of your cutting boards into a bowl. Thanks Scott….....now you got me thinking…...this may not end well! Appreciate it…. Looks great! It should inspire more folks to try their hand at turning bowls. Thanks for the info and pics Jeff. That looks like a lot of stuff but I am sure I can start with a little less, have to look around for some used stuff to keep the cost down . Lot’s of good used stuff out there…..looking forward to seeing what you come up with…..
Looks good Jeff. The turning thing can be addictive.